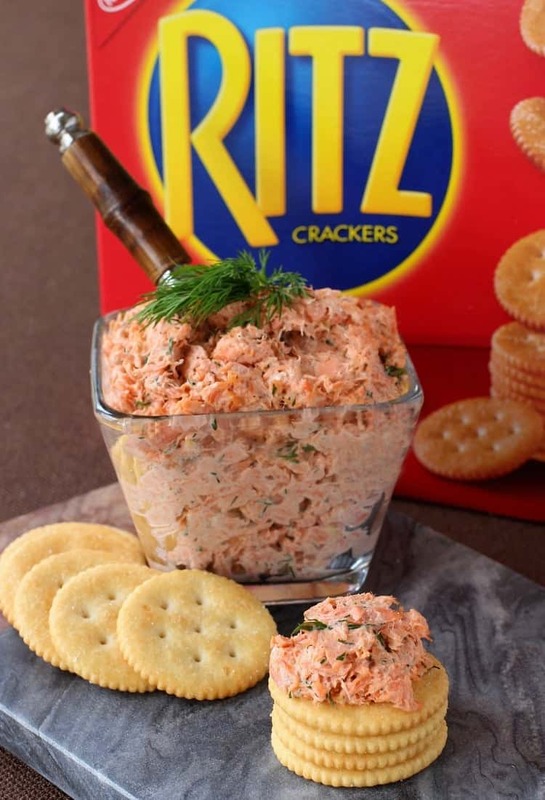 Easy Salmon Cracker Spread loaded on RITZ Crackers is the perfect appetizer for Game Day! 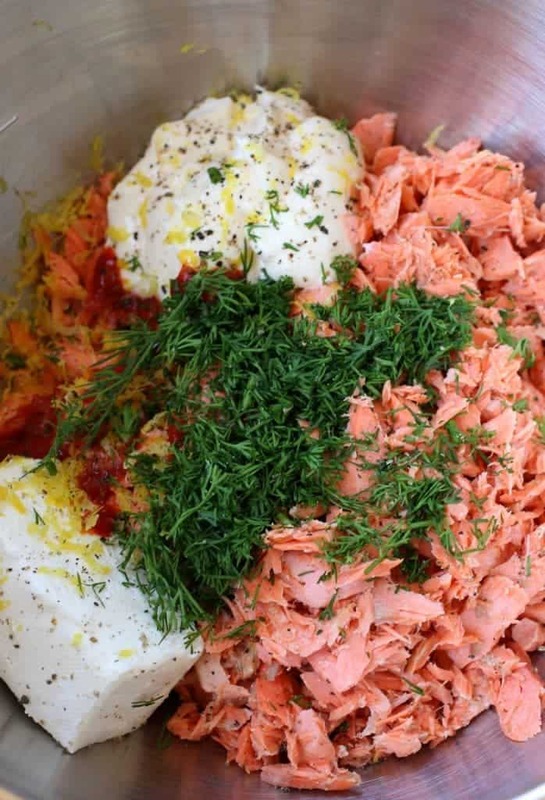 Fresh salmon, dill, cream cheese and mayonnaise…it’s so good! There are tons of appetizers going on for our Game Day party…let’s face it, besides the actual game the food is the best part! BUT…we just got through the holidays and I know that I’ve done my share of indulging lately. So I thought why not add in a lighter, slightly more healthy option in between all the nachos and other snacks that are going to be out there for grabbing? My boys love salmon – my wife does, too. I’ll eat salmon but it’s not going to be my first choice for a seafood dinner. 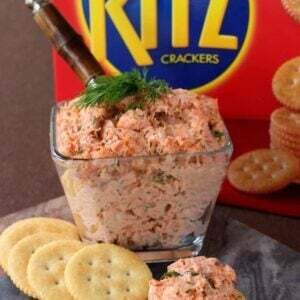 I say this because even if you might think you aren’t a fan of salmon, you should sill give this Easy Salmon Cracker Spread a try. It’s fresh, creamy, full of flavors and the perfect thing to spread on top of a RITZ Cracker. Those buttery, crispy RITZ Crackers are the best thing to use for this recipe, the flavors go together so well that there’s really no substitute! I used fresh salmon for this recipe but you can totally substitute canned salmon here – it’s a great use for canned salmon if you don’t have fresh or frozen on hand, so don’t be afraid to grab a few cans the next time you’re out shopping for groceries! I usually get as many ingredients as I can at Walmart. It’s one stop shopping, you can’t beat the prices and everything is really easy to find so I can be back home as soon as I can. We’ve got to get this party going…and the boys pitch in to help me get ready. That’s another great part about watching the game, everyone gets to spend time together doing something we love. Eating and football. Two things we love. If you’re starting out with fresh salmon, just give it a little salt and pepper and throw it into the oven for about 12 minutes until it flakes apart. Let it cool then break it apart with your hands or a fork, then put it into a bowl with cream cheese, fresh dill, mayonnaise, lemon juice and zest and a drizzle of sriracha. You can use a little hot sauce too if you like – it’s not going to make it spicy – it just makes it better. Mix that together and we’re going to call that app done. Cover it and let it get cold in the fridge while you get the rest of your party together. I like to grab a few drink options, one of them being Coke Zero. 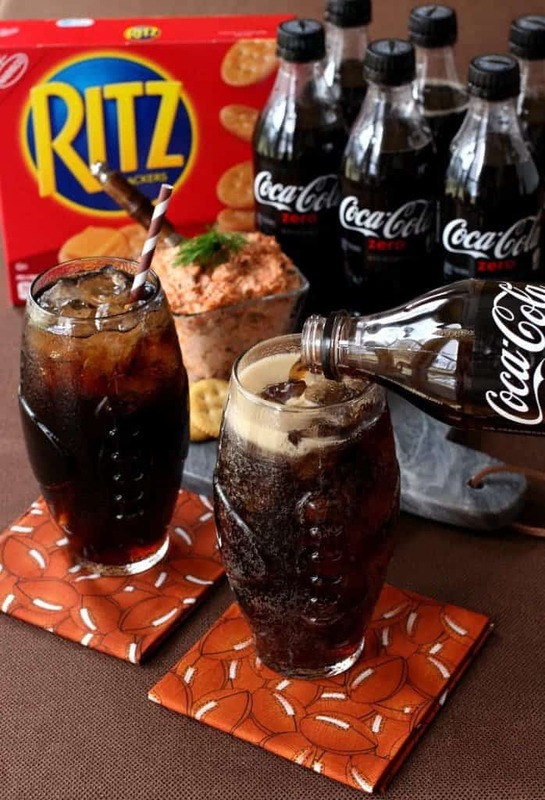 Another way we can cut down on the calories without cutting back on the flavor is to grab a drink like Coke Zero that has well, zero calories. And if you have cool looking football glasses like these it makes the party feel more fun! Or if you don’t want to run out and buy stuff for a party, use your imagination and turn your food into the decorations. I used cookie cutters to make X’s and O’s out of some of the cheese on this cheese board. You can use a knife too even if you don’t have a cookie cutter! You can also cut out the meat or cheese into an oval shape like a football. There’s lots of options if you don’t want to spend money buying football decorations. Now grab your Easy Salmon Cracker Spread from the fridge, get it into a bowl and place it on a cheese platter like this one. 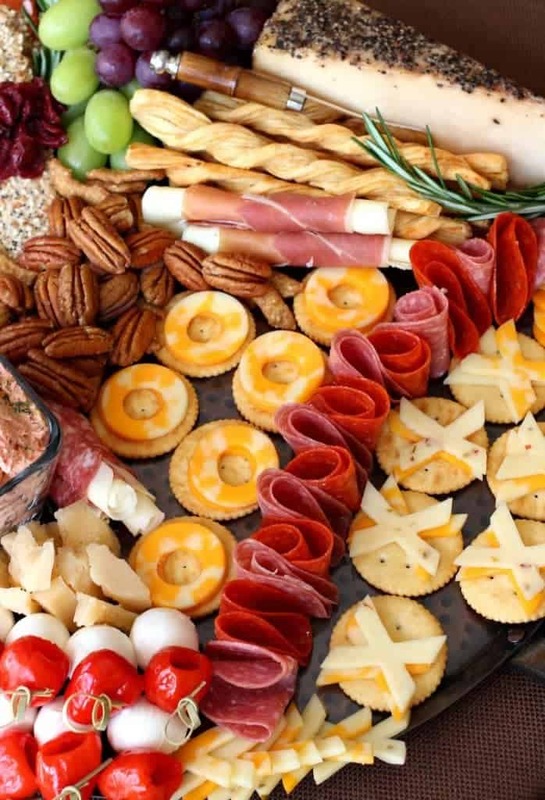 Making up a platter like this with different kinds of cheese, meats, grapes and nuts is a great way to entertain. 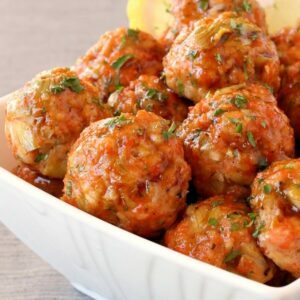 It’s a pretty impressive appetizer to put down on a table, and it doesn’t take that long to put it together. I like to have one or two homemade food items on the platter along with mostly store bought items. 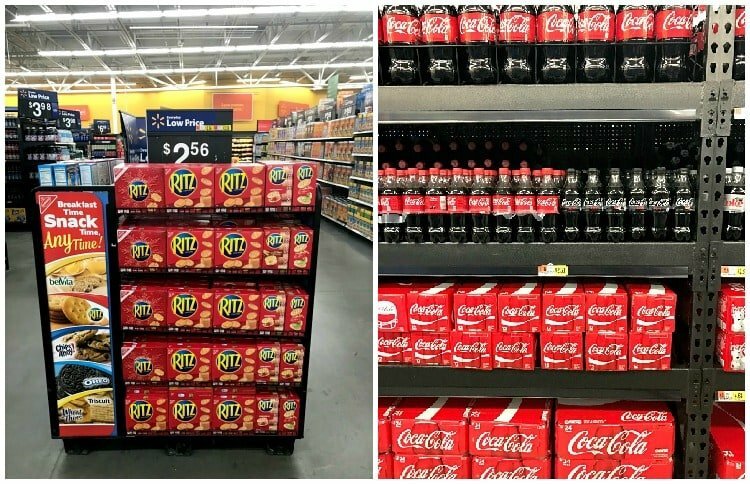 Then you can grab your Coke Zero and any other football decorations you have. Everyone watching football probably has a football, so I like to set a couple of those out for tossing around or just for decoration. Penalty flags work great for decorations too – or if any of your party guests get a little too rowdy watching the game…throw the flag at ’em. 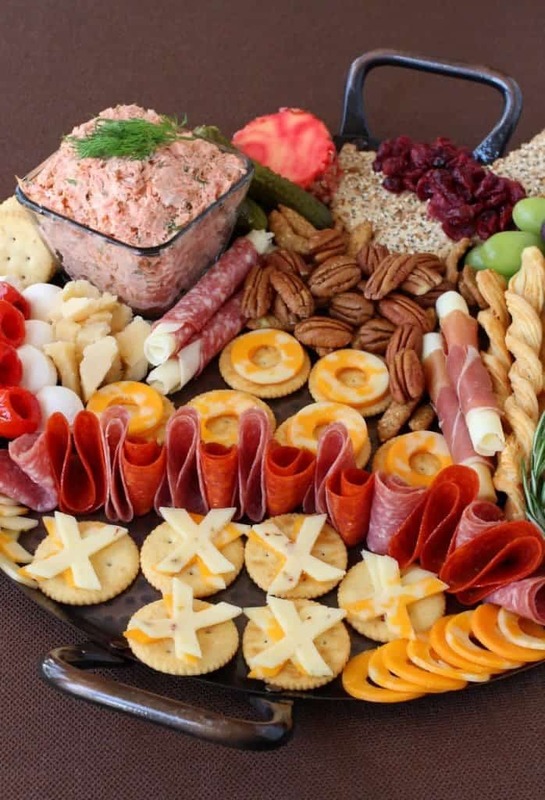 The hero on this platter is the Easy Salmon Cracker Spread. The adults and kids will both eat it up, everything goes great with a RITZ Cracker! 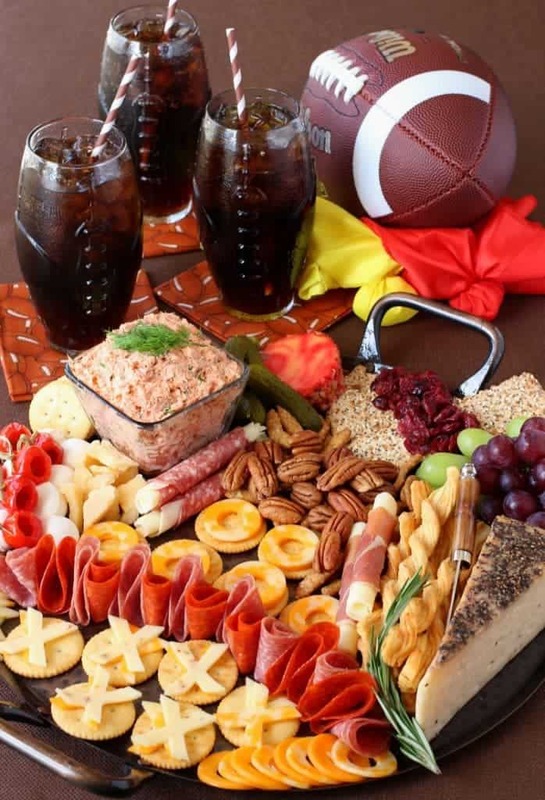 Click HERE for #ReadyForKickoff appetizers and Game Day food ideas! If using fresh salmon, preheat the oven to 400 degrees. Season the salmon lightly with salt and pepper, place on a foil lined baking sheet and bake for 12 minuets until the fish flakes apart. Remove the skin from the bottom and place into a medium sized bowl to cool. Flake the salmon with a fork or your hands, then add the cream cheese, mayonnaise, dill, salt and pepper, lemon juice and zest. Stir to combine then cover with plastic wrap and chill until ready to serve. 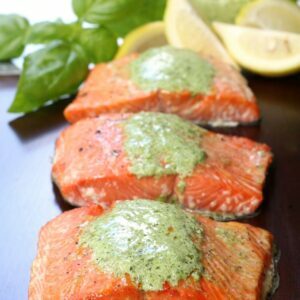 If using frozen salmon thaw completely before putting in the oven to bake. 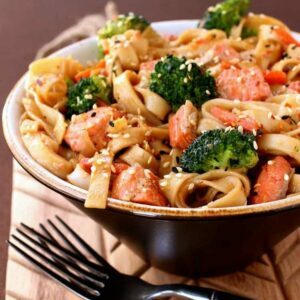 If using canned salmon just proceed to adding it to a bowl with the other ingredients. That tray is SO pretty and impressive but I love that it really isn’t that hard to put together! A perfect Game Day option! !